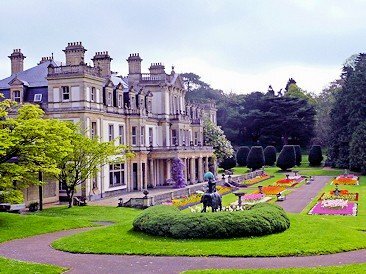 This remarkable 55-acre (22-hectare) Grade I listed Edwardian garden, located in the heart of the Vale of Glamorgan, has as its centre a grandiose Grade II listed mansion remodelled in 1893 for coal magnate John Cory, who had purchased the property two years earlier. Cory commissioned eminent landscape architect Thomas Mawson to design a garden around the house and a masterplan was produced in 1903-04, although work did not begin in earnest until 1906. After John Cory’s death in 1910, his son Reginald, who had studied law at Cambridge but found horticulture much more interesting, collaborated with Mawson on the design and over time became a fine horticulturalist and enthusiastic plant collector, sponsoring expeditions for plant hunters such as George Forrest, Ernest Wilson and Harold Coomber. Members of the Cory family continued to live at Dyffryn until 1936 and shortly afterwards the property was leased to Glamorgan County Council and eventually purchased by Vale of Glamorgan Council, who with the help of a Heritage Lottery Fund grant began a process of restoration to both house and garden. In 2013 the National Trust took over stewardship of Dyffryn on a 50-year lease and is continuing with that work. 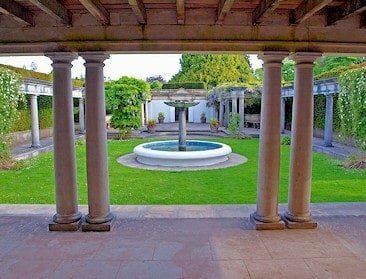 In their original and somewhat eclectic design, Mawson and Reginald Cory managed to incorporate features and styles from several periods in British garden history as well as influences from around the world. Nowhere is this more obvious than in the Roman-styled Pompeian Garden, inspired by their joint visit to Italy in 1908. Here columns, colonnades, fountains and loggias are softened by wisteria and clematis. Other themed outdoor garden ‘rooms’ include a Mediterranean Garden, Physic Garden, Theatre Garden (where Cory displayed his collection of Bonsai), Cloisters, Reflecting Pool Garden, Rose Garden and Lavender Court. In some ways these ‘rooms’ were ahead of their time as they pre-date those at Hidcote Manor and Sissinghurst by several years. Linking everything together is a much larger landscape, befitting to such a grand house, with lawns, borders, topiary, extensive arboretum of rare trees, a very fine rock garden set upon a natural limestone outcrop, heather garden and a central canal running southwards from the house. Some of the finest restoration work to date includes gloriously colourful herbaceous borders, a productive Walled Garden full of vegetables, fruit and cut flowers and a Glass House which contains excellent displays of orchids and cacti. Give the day over to this garden, it deserves it.